Can you really teach yourself to play piano? Sure, it is absolutely do-able! But as with all skills there is of course a range from being an amateur to a master pianist. 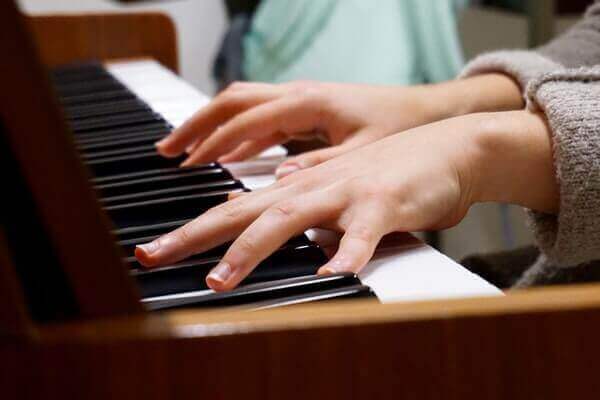 Most adults who want to learn piano don't actually aim to become a professional pianist, but mostly to be able to enjoy playing an instrument, play some songs, accompany songs, maybe improvise or play some beautiful pieces. You can generally not teach yourself to play piano and become a professional pianist; you need years and years of training with the best piano teachers, a huge amount of dedication, ambition and sacrifice. However, it is possible to teach yourself to play piano as an adult and become a good pianist. How good? Well, it is entirely up to you how hard you want to work! How Fast Can You Learn to Play the Piano? You can learn to play a melody in 5 minutes. You can learn to make up your own music instantly. You can learn to play chords in anything from 20 minutes to a couple of days- it depends on your coordination skills among other things. You can learn how to read piano notes easily and quickly. Easy, simple piano music is very much possible to learn really fast. Then it is up to you how far you will go! One great thing about playing the piano is that it sounds good immediately. Another instrument might sound false or be difficult to get a sound out of at all in the beginning. At the piano you press a key, and ta-da there is a perfect note! The magic about piano playing is exactly how you press down that key. You need imagination and expression. Try it now, press down a key on your piano- anyone, it doesn’t matter. OK. Now press it down again as if it was the most precious note in the universe...release it carefully. Wow. That should have been a huge difference! With enough drama and imagination you could go in on a stage and play just one single note on the piano and make people love it! Well, OK. That’s a bit silly- I hope I got my point through- of course you want to play more than one note! Just remember that how you play is more important than what you play. 1. First of all, get a piano method for adult beginners like Alfred's Self Teaching Piano Course. 2. Set up your piano work place to be as inviting as possible. You will need a good piano, a comfortable chair, and great lighting. 3. Decide to devote a certain time each day for piano practice. When you teach yourself to play piano you need a certain amount of self discipline. -Remember it takes about 21 days to form a new habit. 4. Start each session with some form of warm up. You can stretch and flex your fingers, arms and neck. Yoga! Do some stretching that feels good. Use your right hand to play the black keys on the piano, from the middle going to the right- this is “up” on the piano. Use your left hand to play from the middle going “down” or to the left. Press down the right pedal if you wish, it sounds nice! Make up your own little melodies on the black keys. Everything you do sounds great here! This is a pentatonic scale you play, using only black keys. 5. Use a piano course with DVD's; this makes sure that you follow a step by step approach, and you can see how it's done but still work at your own pace. Try for example Learn and Master Piano, a complete piano DVD course for adult beginners. 6. Make sure to end your session when all works well- if you end on a happy note it is much easier to get back to practice the following day. You do not need long sessions- how much time you practice is up to you, but you can have great results with 10-30 min each day. The trick is regularity, the more often you play the piano, even short sessions, the more progress you make. 7. Make a habit of playing a repertoire of songs that you have learned, before you finish. Even if it is only “Mary had a little lamb” at first. Keep a selection of pieces handy that you can play by heart, wherever you go. But remember- use them or lose them! Unless memorized pieces are played regularly, you will forget them. For newly learned pieces, play them every day. After a week, once every 2 or 3 days should be OK. After that once a week for as long as you want to keep them. 8. Listen to other pianists and musicians often. Listen to a lot of piano music to keep you inspired. YouTube is also great to see how other pianists are learning. You can buy DVDs with your favorite pianists and styles. Go to concerts whenever possible. See if there are any nice magazines for amateur pianists available. 9. Keep a journal. Write down your goals, your progress as well as thoughts or questions after each practice sessions. Divide your goals into manageable tasks, baby steps. Tick them off as you learn. It is great for your confidence to see the progress you make. Since you teach yourself to play piano, you are your own teacher, so you have to monitor your own progress! 10. Spend a few minutes each day to pick out simple melodies playing by ear. Start very simple- "Hot Cross Buns", for example. Then gradually up to "Twinkle, Twinkle Little Star". Five minutes a day is all you need. Continue with parts of melodies you hear on the radio. A little at a time. This is a very healthy practice habit when you teach yourself to play piano! Remember this simple but very true saying: Stick to it and you’ll do it! It is by sheer stubbornness anyone makes progress and succeeds. Not by talent or inspiration. You can never fail if you never give up!